HomeASEANWhy invest in Vietnam’s private hospitals? 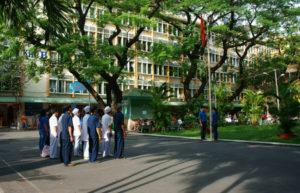 Why invest in Vietnam’s private hospitals? Premium ROI: While most private hospitals have aimed at overseas workers and families of foreign-employed Vietnamese citizens, there is a five-folds increase in the middle class sector in the country. It is also estimated that the country has one of the world’s fastest growing wealthy segment. Many foreign investing firms are looking to capitalize on this and have been paying a premium to acquire majority stakes in hospitals. In 2013, India based Fortis Healthcare sold its entire stake in Hoan My Medical Corporation for a premium price of $80Mn to Viva Holdings Vietnam. Government support: In its attempt to attract foreign investors, the government is allowing unrestricted entry for qualified foreign doctors to practice in the country. It is anticipated that with the rapid growth of middle income groups in Vietnam, the patient pool demanding high quality healthcare will increase. About 8-9 million of the Vietnamese population may fall in this bracket, thereby making a good business case for hospitals looking for expansion in the country. Of the ~150 private hospitals, many need a structural reorganization and operational streamlining to improve their bottom lines. Investors can capitalize on such hospitals by bringing in international expertise of hospital management while potentially harnessing high ROIs in a high growth market.